Wild, untamed lands hold a wealth of mystery and danger, providing the perfect backdrop for heroic adventure. Whether adventurers are climbing mountains in search of a dragon's lair, carving their way through the jungle, or seeking a long-lost holy city covered by desert sands, Pathfinder RPG Ultimate Wilderness gives them the tools to survive the wilds. A new 20-level base class, the shifter, puts animalistic powers into the hands—or claws—of player characters and villains alike, with new class features derived from animalistic attributes. Overviews of druidic sects and rituals, as well as new archetypes, character options, spells, and more, round out the latest contribution to the Pathfinder RPG rules! 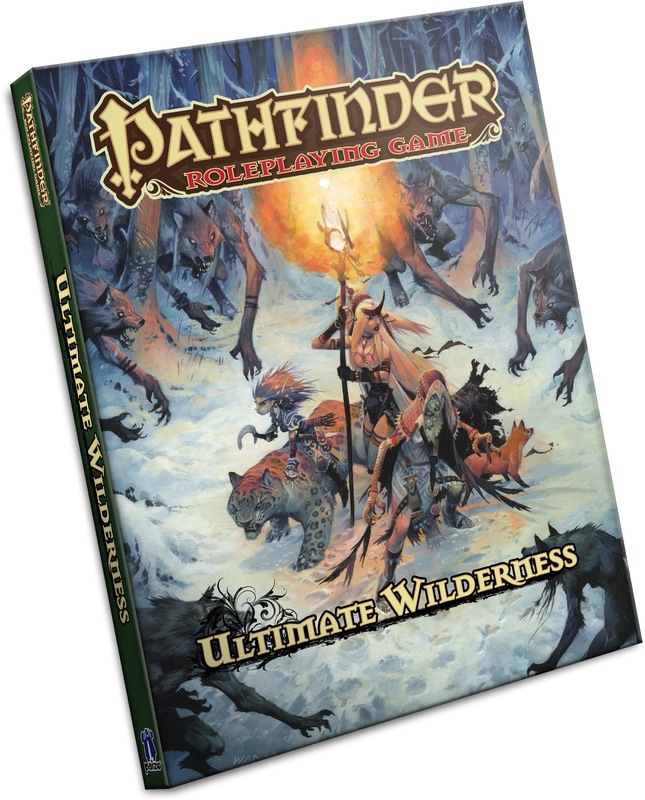 Pathfinder RPG Ultimate Wilderness is an invaluable hardcover companion to the Pathfinder RPG Core Rulebook. This imaginative tabletop game builds upon more than 10 years of system development and an open playtest featuring more than 50,000 gamers to create a cutting-edge RPG experience that brings the all-time best-selling set of fantasy rules into a new era. The shifter, a new character class that harnesses untamed forces to change shape and bring a heightened level of savagery to the battlefield! Archetypes for alchemists, barbarians, bards, druids, hunters, investigators, kineticists, paladins, rangers, rogues, slayers, witches, and more! Feats and magic items for characters of all sorts granting mastery over the perils of nature and enabling them to harvest natural power by cultivating magical plants. Dozens of spells to channel, protect, or thwart the powers of natural environs. New and expanded rules to push your animal companions, familiars, and mounts to wild new heights. A section on the First World with advice, spells, and other features to integrate the fey realm into your campaign. Systems for exploring new lands and challenging characters with natural hazards and strange terrain both mundane and feytouched. Another Great Hardback Update Collection! Ultimate Wilderness is a much better book than some reviewers might lead you to believe. You get the new shifter class - which has had some basic errata since release - along with great archetypes for most of the other classes to help them fit into a wilderness-based campaign. It's a great book to help players prepping to play something like Kingmaker or Ironfang Invasion. You get new spells, feats and a new exploration mode. The book itself maintains the high quality of work that most Paizo products exhibit. The art in this book is some of my favorite in any of the hardback collections. There are a few updated spells that needed errata, such as snowball. As a fan, I really like that several of the archetypes convert the flavor of many Game of Thrones characters into Pathfinder mechanics. What more could you ask for? I was extremely excited for this publication, so it's rather depressing how disappointing the books contents turned out to be. The shifter class was an interesting idea, but when put down on paper is just druidic wild shape with hunter focus, in the form of aspects. It, unfortunately, never surpasses the druid in the wild shape department, and is, in fact, rather limited, and the temporary nature of all the aspects means that the shifter isn't terribly impressive in that regard either. The archetypes, both for the shifter and other classes, are interesting, but several suffer from massive drawbacks, for little to no gain. Like taking on druidic weapon/armor proficiencies and restrictions, including losing abilities for wearing metal, but don't gain any significant power to mkae up for it. The new rules expansions are, for the most part, only thrown off by some conflicting skill applications (survival to harvest poison, but heal to take internal organ trophies?) but these are easy to ignore, or fix by homebrew. So these chapters are the most stable and useful of the lot. One of the most exciting discoveries was the Cultivate Magic Plants feat, allowing you to grow plants that copy spell effects, but the price tag attached to them, especially when attached to something with the considerable disadvantages of being an immobile magical item, makes it entirely useless next to the crafting cost of regular magical items, especially if you have a GM that's willing to allow players to use the rules on creating new magical items. Just for an example, a goodberry bush can fully feed 2 people per day forever... for 4000 GP to craft. While you could make an item to infinitely cast goodberry for 2000 gp if you have to wear it, or better yet create food and water (for about 30000). In conclusion, the book has a lot of cool stuff in it, but only for GMs. Players won't be able to make good use of many of the archetypes and feats as they revolve too much around staying in a single environment or working with nonsensical restrictions. While many of the feats are just too focused (or expensive) to be useful except to an NPC. GMs, grab it, it's got good stuff, but players will (and should) probably stick to what they've already got. Great race write ups, a fun new class (that doesn't require a ton of source books to play) and tons of information and systems to run a wilderness adventure or spice up the wilderness sections of any game. Definitely happy to add this one to my bookshelf. First off, I'm a huge fan of Pathfinder. But I'm not a fan of "Ultimate Wilderness." There are a number of issues with the content in the book, mostly the clarity of language. A lot of the rules seem unclear and not straightforward. The shifter is the biggest example of this. To be honest I was looking forward to the shifter, being far more robust than it actually is. And I understand that this is my issue with what I expected from them, but what built up my anticipation of the shifter was the quality of past classes released by Paizo: summoner, alchemist, witch, bloodrager, investigator, brawler, spiritualist, medium (even if it isn't harrowed), magus, ninja, hunter and so on and so forth. Past that, I'm not a big fan of the reprinted material because I buy the smaller books. If I'm buying the smaller books why would I want to buy them again with a hardcover? That being said, I'm still a big Pathfinder fan, but I'd like for future releases to take a different developmental cycle than what "Ultimate Wilderness" received. This book seems like it lacked editing and playtesting. Announced for November! Description and image are not final and subject to change. A wild-shape focused class without 9-spellcasting levels? Sign me in. This might solve a LOT of conceptual problems with the druid, to be honest. I honestly hope the focus of the book is not only the fey, as it would be a waste to not include rules for elemental realms into this. Can't wait to see Shifter and all the associated archetypes! Thank you, Paizo. I've been wanting this book for ages. Someone help me out - this makes how many hardbacks that are being released this year? Four? Bestiary 6, Ultimate Wilderness, Ultimate Adventurer, and one the name of which escapes me. My relatives are going to freak out when they see my Christmas list. EDIT: Is the fourth one the Book of the Damned or something like that? Villain Codex just recently released. Bestiary 6 coming April 26th of 2017. EDIT: There's also The Book of the Damned coming Sept 2017. I hadn't included it as I thought it wasn't the "mainline" because its very-very tied to their "world" but with the Villain Codex and the Adventurer's Guide they're mixing their IP with their "world-neutral line" a lot. And it looks like this is officially just "main line" not a supplement in the Pathfinder Campaign Setting stuff. I AM SO EXCITED RIGHT NOW! I've wanted to see a true shapeshifting base class forever!!! I really don't have any uses for the codices, to be honest. But the others are really exciting for me. I'm a little surprised to see this announced already. I figured it would be announced at a convention or something. A martial shapeshifting class. I'm soooo ready for this. Will the Shifter have a play test? So a bit of a hint on the shifter. Glad to see you guys are excited! To expand very vaguely on this bit from the product description: "New archetypes for alchemists, bards, druids, hunters, inquisitors, investigators, kineticists, mesmerists, paladins, rangers, rogues, slayers, and more!" I'll mention that brawlers (who haven't had an archetype in quite a while) are one of the other classes among the "and more". Wow, I was just thinking something like this would be cool...though admittedly I was hoping for expanded rules on things to do with parts of various monsters and thought a book like this would be nice to see something like that in. But the shifter sounds fascinating, I've always loved shapeshifter concepts, but the druid has way too much baggage for my tastes, so it'll be interesting to see what the shifter brings to the table. Definitely interested to see what all's inside this book! This sounds great! I love the Ultimate books. Wow, I was just thinking something like this would be cool...though admittedly I was hoping for expanded rules on things to do with parts of various monsters and thought a book like this would be nice to see something like that in. Great move, excited about this book ESPECIALLY the Shifter. Seriously, though, my love of shape shifting abilities causes me to take great interest in this product, and the sections on Animal Companions and terrain-based challenges only further my excitement. I'd probably be willing to get this one just for the shifter, though the additional info on the fey, First World, and animal companions helps too. Hope it isn't limited to animals... You know what other type of creature I would like to shift into... At least an archetype for a dragon shifter. I hope this means the occasionally headache-inducing polymorph rules get something like the unchained treatment! Shapeshifting is a super cool concept but is pretty daunting for new players. Yeah I don't see where it is a martial either. I mean it may be but it might not be. Indeed, that was pretty much what I was thinking...you'd need a decent bit of space to cover it, so some sort of Ultimate or Adventures book focused on wilderness or something similar seemed like a possibility at least, though of course, it may or may not actually be here...was just surprising since I was thinking about that just a day or two ago and this popped up. Would be cool if it's covered, but, well, I find the best way to be happy about products is to not get too attached to something and just wait to see what cool things are inside instead of getting upset by what isn't! So what is meant by the "Expected to arrive and ship separately from Paizo's monthly shipment" note for this item on the subscription page? What is strange is that the adventure path item for the same month has the same note. I think that's an excellent mindset to have. I seem to remember someone who was completely convinced that Ultimate Intrigue was going to have a spell to change into an ooze in it, and then when it didn't, he was very upset. Better to be excited about what it does include; there's at least a few surprises that are very difficult to guess! I thought Paizo had said the Vigilante was going to be the last class for awhile. Color me... intrigued. Woot! So jazzed about this. Wilderness Survival Guide was the last 1st ed &D book published, in 1986. Shifter will hit a little over a year and a half after vigilante, and I believe that's the biggest gap we've had without a new class so far since the Core Rulebook, though I might be mistaken. In fact, this book would be coming out a year and 8 months after Ultimate Intrigue, according to the Archives of Nethys entry for Ultimate Intrigue. Also, I just realized the synergy today: check out the new Bestiary 6 blog for a new type of monster themed on different types of wilderness, perfect in combination with Ultimate Wilderness! Thanks for pointing it out, I edited it as I could. Second, what gives you the right? Shapeshifter is literally my number one class that I've been clamouring for since the dawn of time. The only fantasy archetype I wasn't satisfied with (no offence Druid but you have entirely too much going on). And then you just GIVE this to us! Fulfilling the hopes and dreams of generations? Sure they won't be the strongest in matters arcane, but I think they'll be quite formidable indeed. I wonder if any part of this was "salvaged" from the announced and planned Encounter Codex, that was shelved etc. for reasons? An urban archetype for the shifter focused ondisguise and humanoid shapeshifting. A kineticist archetype that allows the kineticist to change their elemental focus daily, or even faster in exchange for Burn. A wilderness archetype for the Vigilante. So much fun stuff in this book. People are definitely going to enjoy it. But at least the transition from 1st to 2nd edition D&D was a far less disruptive compatibility break than any later edition change. No monster conversions were required at that point. They did publish several monster books for 2nd edition, but strictly speaking they did not have to. Hah, I knew we were getting an environment book. I wasn't expecting the shifter, though, so I'm excited. I'm wondering if we'll have any expanded skill uses for climb, swim, and the like. Hey this sounds like it might be really useful for my Kingmaker game. Too bad it's so far away. More excited about this book than the last couple though. tell me that she can't change into animals only! Tell me that she will be as versatile as hell! I curious to see how Ultimate Wilderness's Shifter class compares to Sphere of Power's Shifter class. Really looking forward to seeing more info about the new Shifter class. Also really hoping it gets the green light for PFS use.